There are many highs to the experience that is a Pearl Jam show. It’s unspoken — everything is checked at the door and you’re ready to release. Suddenly, the aisles fill to capacity. Your boots start shaking. Your giddy like a kid waiting at the top of the stairs on Christmas morning. You know the celebration is right in front of you. You sip your beer spilling a bit on your shirt from your unsteadiness. Then — it’s time. The lights go down, the intro music starts, and the band takes the stage. Eddie Vedder welcomes all with, “Good Evening.” Though you feel nothing and everything simultaneously over the next three hours, there is nothing quite like the rush of commencement. This summer’s Home and Away Shows exemplified this to the fullest. The opening thrill would change shape and reappear repeatedly– as the band rocked from coast to coast. 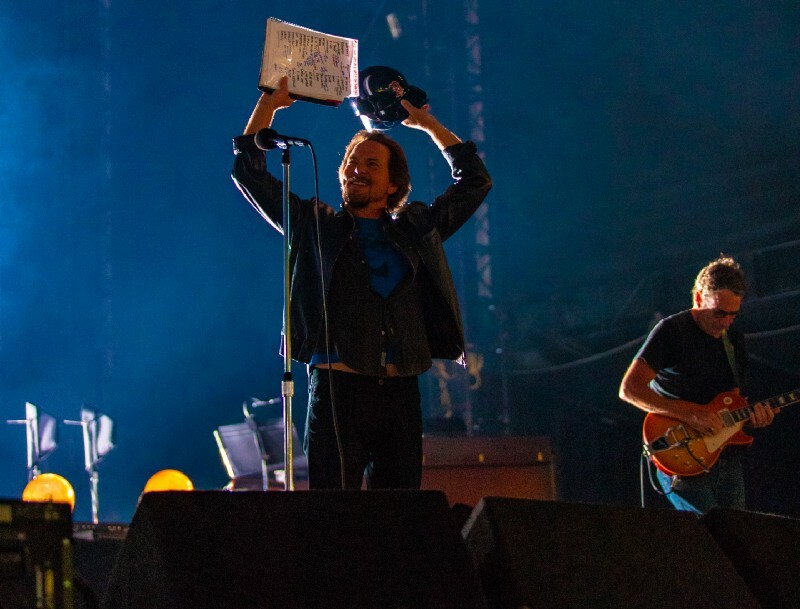 Boston, Fenway Park: Vedder steps to the plate, arms raised in V. His left hand holding a Red Sox helmet and his right hand clutching a setlist where if you look closely, you can see notes laid spread out before many of the song titles. The “Howard Zinn” branded telecaster starts “Sometimes”. It’s the only time that particular axe is used in Boston. Zinn, a late, great New Englander, inspired the Lost Dogs track “Down” — which is played seven songs later. A great Irish city toasts a great Irish man in sending love to Bono who lost his voice the night before. With respect, “Army Reserve” is dedicated to brave soldiers like John McCain. 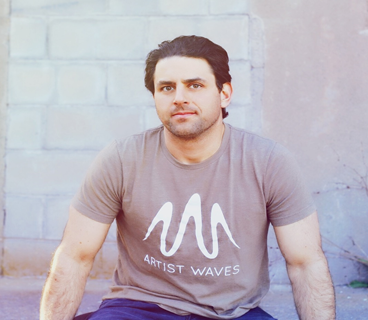 “Amongst the Waves” is played for the brothers Steve and Joe — (and the Krasinki’s). The band invites Bill Janovitz to join them both nights and they rip through his Buffalo Tom classic, “Taillights Fade” — a favorite of Vedder’s dating back to being on the bus in 1992. Janovitz returns for “Dirty Water” during game two. 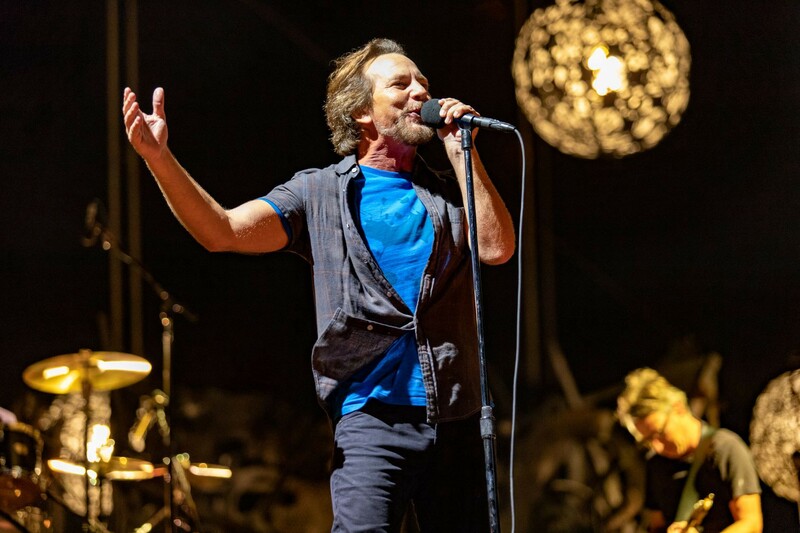 A month earlier at Safeco Field, in case raising 11 million to help fight homelessness was not enough, Brandi Carlile, also from Seattle, grinned from ear-to-ear as she graced the Pearl Jam stage and together they perform her song “Again Today”. Kim Thayil from Soundgarden, and Mark Arm and Steve Turner from Mudhoney make guest appearances. Local teachers are honored in the form of Jack White. The “Even Flow” story is told. Chris Cornell’s “Missing” is covered. In Montana, a Rock2Vote show, Vedder wears an Evil Kneivel (a Montana legend) jacket. This stop, aimed at energizing voters, supports four non-profit organizations who are educating and helping ensure people go vote. 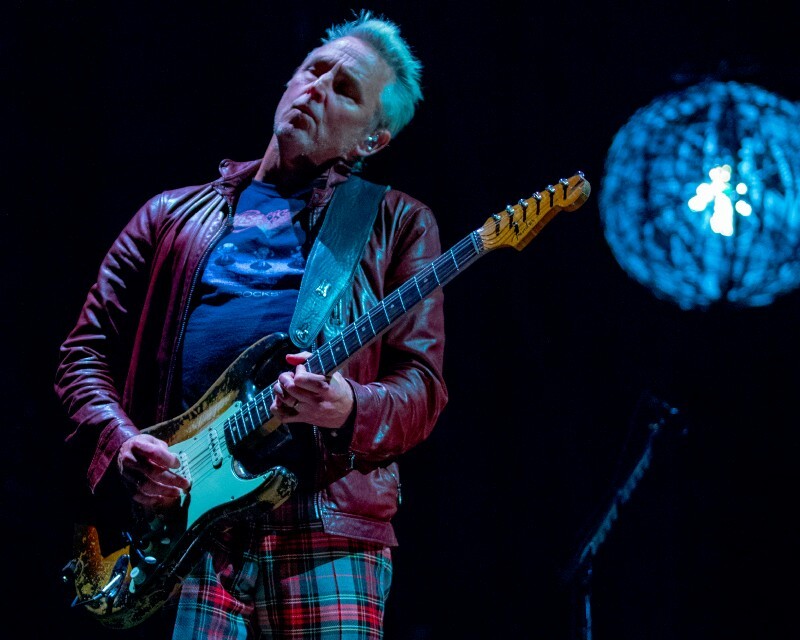 The partners include Forward Montana, Montana Native Vote, Montana Conservation Voters and Planned Parenthood Advocates of Montana- and the night consists of a Jeff Ament (Montana native) heavy setlist. In Chicago, Cubs owner Tom Ricketts brings the Cubs 2016 championship trophy to the stage. The band thanks him for assisting their historic “Lightning Bolt” show. They launch into David Bowie’s “Rebel Rebel” as David Bote’s walk-off grand slam plays on the big screen. “Throw Your Hatred Down” is dedicated to the south side. “Evil Little Goat” makes its live premiere. Tom Petty is remembered with a chilling version of “Won’t Back Down” played on Petty’s guitar. During game two, Vedder (a Chicago native) holds a Stan Mikita Blackhawks jersey with Chris Chelios, while sporting Air Jordan’s upon the center field stage of Wrigley Field. What am I getting at here? … There is not a more thoughtful band on the planet. There’s an underlined theme in each highlight mentioned above. Whether it’s banding together to fight homelessness with other key players in your community, or simply engaging with one person like Janovitz, you go much further when you go to together. 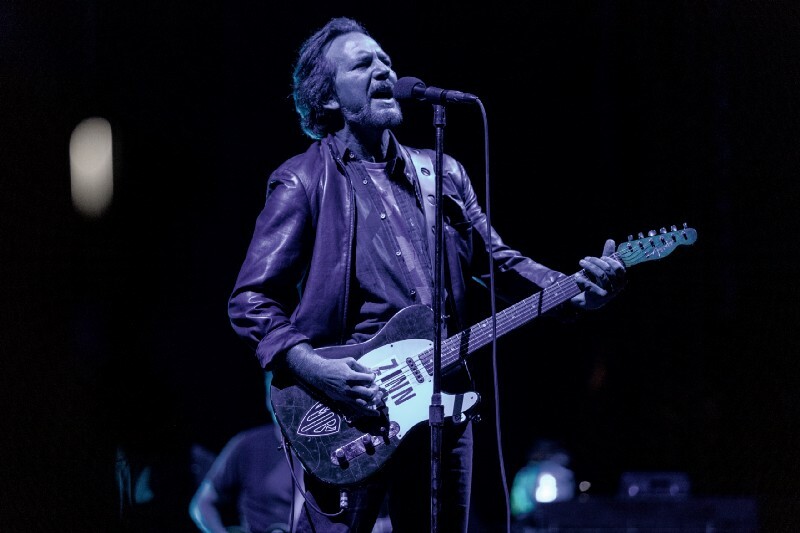 Pearl Jam’s first ballpark concert — Wrigley Field in 2013, presented a significant challenge in persevering through a treacherous rain delay. Three years later, there were not only two shows at Wrigley, but also two at Fenway. 2018 then called for six ballpark stops and one stadium — adding in Safeco Field and Washington-Grizzly Stadium. Even after 27 + years, there’s a lesson we can all keep from this tour as nothing was taken for granted, everything was earned, and change don’t come from one it’s a wave. As a father, that is one of the most beautiful lyrics I have ever heard. The sub-headings here so far have been from Fenway’s “Immortality”. Further backing my point of thoughtfulness, at the intro you can quietly hear Vedder say, “do this one a little different tonight.” This performance referenced lyrics from 1994’s legendary Boston Orpheum show where an early version of “Immortality” was introduced. The truth is, sometimes you fall right off the face of the earth. But when you follow the attitude of “the love I have for you and her”, you get back up. And that’s painting the earth. Thanks to the Away Shows, I met a friend from across the country in person for the first time — who was not only going to join me in the audience but photograph the band. Thanks to the Away Shows, I spent three days with a family member who I rarely get to see. Thanks to the the Away Shows, I learned about a local ALS movement (an issue near and dear to me) and I’m proud to say I now have a Café Martin hat staring back at me. Thanks to the Away Shows, I participated in Given to Live’s beautiful mission. Thanks to the Away Shows I was able to dip my pen in an ink that had been sealed shut for a long time. It is now about 25 minutes from the 2018 tour being over. “Smile” concludes. Booooooom Gaspar glides in on the B3. 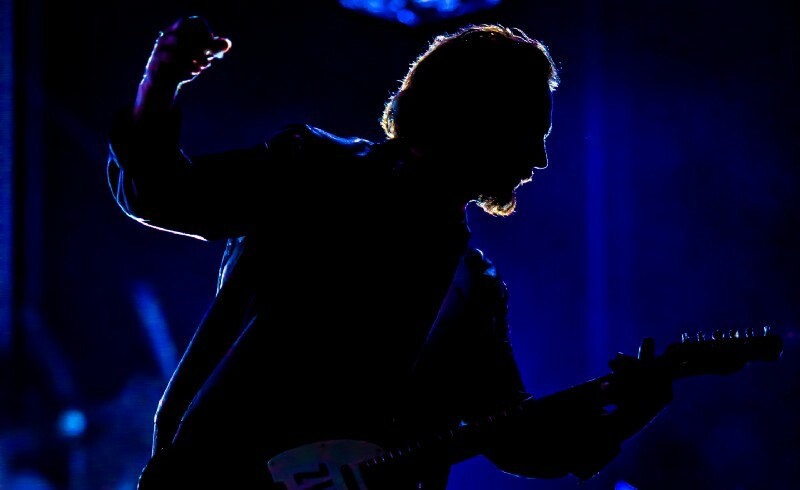 Vedder, well,… smiles. After toasting the Red Sox organization and John Martin he delivers a heartfelt, “You know, the energy of large groups of people, it has a lot of power.” He explains how back home in Seattle it can be hard to imagine being in a position where you are playing a landmark like Fenway Park as they are simply proud members of their community. I don’t want to speak for anyone, but I am confident in saying the same holds true for the audience. 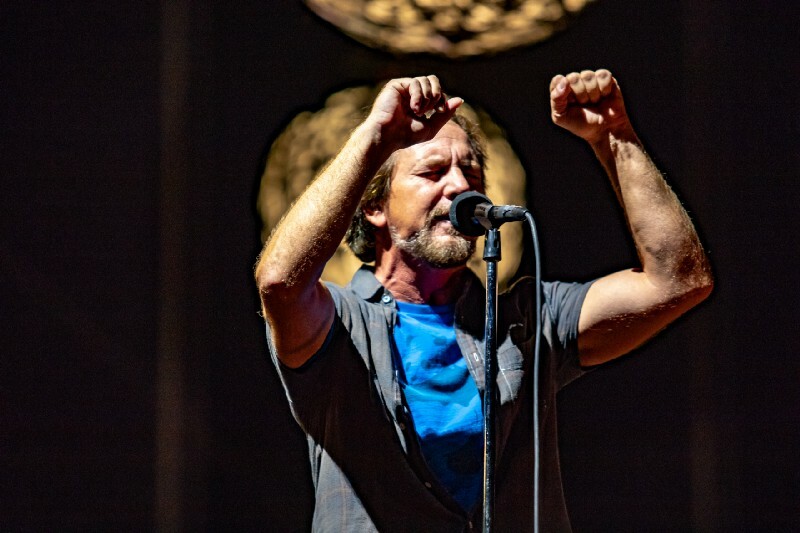 Aside from friends and families, I’m not sure there’s anything we are prouder of than being Pearl Jam fans and having the opportunity to partake in outstanding efforts that result in making a difference. The thing is… within the greater Pearl Jam community, and certainly at a show, we are all riding upon the same surfboard. If you fall off, there’s an ocean of people there to pick you back up. Because that’s what we were taught. Because that’s what we want to do. Because that’s what the music inspires. Because we are all alone in this together. It’s a fragile thing this life we lead. If I think too much I can get overwhelmed by the grace in which we live. 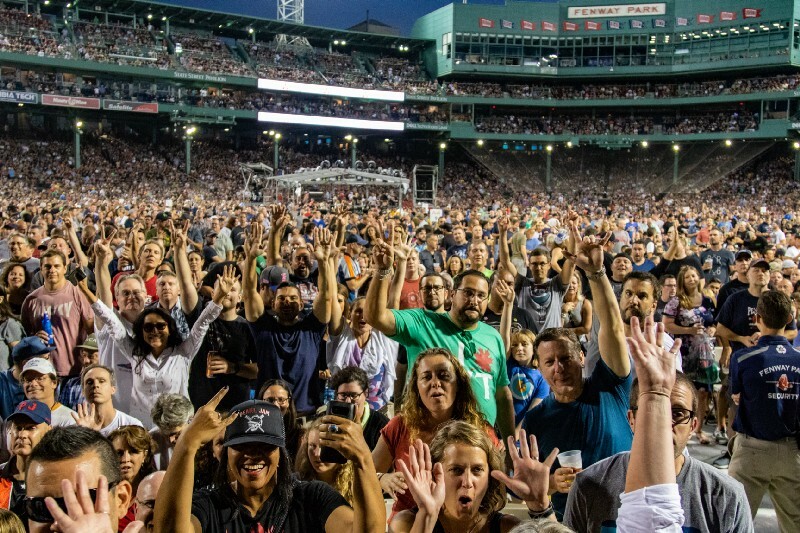 “Music gives us all these reasons to connect” ~ Eddie Vedder, Fenway Park, September 4, 2018.